Tinytag Plus LAN data loggers plug into a network point, recording and sending their data via Ethernet connectivity for viewing in the Tinytag Explorer Connect software. They are powered through their LAN connection using a plug-in Power over Ethernet (PoE) adaptor and have a back-up for reliability if the PoE should fail. The Tinytag Connect central data management feature of the software enables users on a network to have remote access to the data being recorded in their application. Tinytag LAN loggers can operate as individual standalone devices sending their data from their location via a network point for viewing on a PC in the standard Tinytag Explorer software. If a logger cannot communicate with the system for any reason, data will be recorded locally until communications are restored, ensuring no data is lost. 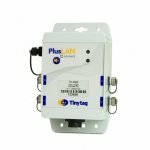 Plus LAN loggers can also be used as a part of a system, mixed and matched in a system with Tinytag Plus Radio and Ultra Radio units, to help meet particular site layout and infrastructure requirements. They are ideal for use in situations where radio signals may be problematic due to network range or physical obstructions, wherever a convenient network point is available. For example LAN loggers can be used in metal-lined walks in fridges/freezers or where a remote monitoring point is required outside the range of an existing Radio System. LAN Loggers in the product range record temperature and relative humidity, and also low voltage, current and count inputs, making them ideal for use with third party sensors to record properties such as pressure, flow rates and footfall.